One of the most popular garments in Auroria is the poncho. Most Aurorian foxes will own at least 5 or 6 ponchos -- of these, maybe one or two will be enchanted in some way. 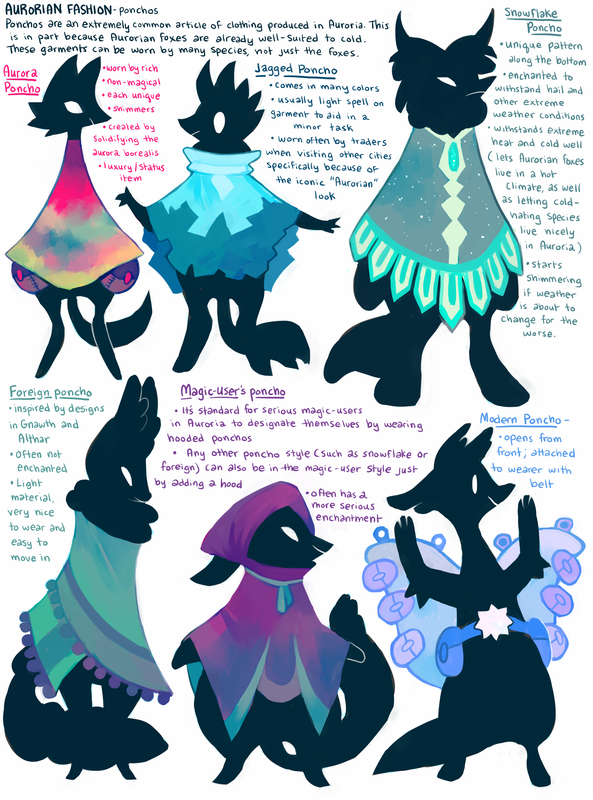 Non-Aurorian foxes will own ponchos often in order to fit in with the foxes, though they usually wear snowflake-styled garments to help them live comfortably in Auroria's weather. The environment and the colors surrounding a poncho-maker will heavily influence the colors chosen for the cloth. The aurora borealis ever-present in the sky is the primary influence on color choice, though the frequency of colors changes depending on altitude. Towns and cities at higher altitudes will make more use of the colors present at higher altitudes, whereas cities colors to sea-level will make more use of the lower ones. Auroria's altitude is approximately between the highest point in their territory and sea-level, meaning that garments in Auroria come in every color. As a result, ponchos made at the lowest altitudes tend to be asymmetrical and triangular-shaped instead of 6 - 8 sided, which attracts "artsy" clothing designers. It can be said that you'll find a lot of "unique" designs along the Aurorian coast. At a slightly higher altitude, ponchos are more decorated with things like tassles or extravagant patterns, but tend towards symmetry. At the highest altitudes, the ponchos are larger and baggier, and make use of simple designs. At ports, or in specialty shops in Auroria, ponchos can frequently be found that will fit a wide variety of species. Particularly tourist species. These "foreign"-inspired ponchos often borrow from Gnawth and Althar for their pleasing geometry usage and for their bead-usage. The classic poncho has no way to open the front, instead fitting over the wearer's head. Pockets have been on the inside of ponchos for centuries, never the outside; these pockets are usually close to the chest area so as to protect important items and goods. The further back in history you go, the less pockets you'll find inside the Aurorian ponchos. The more pockets, the more spur-of-the-moment trading the wearer can engage in. Modern ponchos are hip with young Aurorians but are scorned by the older crowd. They have an opening in the front, allowing the user to show off all of their cool possessions. Nice! Modern ponchos perhaps overdo storage a bit, and many have belts built in to keep the poncho secure to the wearer. A cool buckle is required of the belt, as well. Ponchos are multi-purpose garments, and can be tailored for most any need. Travel, adventure, magic, luxury, style… ponchos are tailored for these things and more. Adventuring ponchos are easy to move in, cutting down on dangly pieces and heavy material. They are nicknamed "cargo ponchos" because of how many pockets line the inside. Common magic enchantments on adventuring ponchos include slight stealth or camouflage enhancements. Magic-user ponchos always have a hood. Magic-using Aurorians will not want to wear any other type of poncho. (A foreigner might ask, "Why?" and the Aurorian responding won't even understand why the question is being asked. "Why what? If you do magic, you wear the hooded poncho. Duh.") These ponchos almost always have but a single pocket, which links back to a chest owned by the wearer, allowing for easy access to their items from anywhere. Perhaps the most irritatingly beautiful of these ponchos is the aurora poncho. They are extremely expensive to produce, and not even magical in the slightest. They are formed via a long and tedious process of collecting the aurora borealis itself and turning it into a delicate, shimmering, wondrous garment. All of the hard-to-harvest magic of the aurora borealis simply gets converted into its amazing beauty in cloth form, rendering the item worthless magically. They're gorgeous, absolutely useless, expensive, and uncomfortable to boot. And extremely popular with rich Aurorians for these reasons. Other ponchos are worn for fashion or are just cheap and mass-produced. These ponchos don't tend to have magic imbued in them. They're simply cloth. Belts that hold even more bags and pockets are also a popular companion to modern poncho wearers. Even more stuff to carry around! More potential trades to be had, anywhere! Even the older generation of poncho-wearers are starting to get in on the belt trend due to its practicality. Help from Exty, who typed the notes I used to make the description!